At only 21 years old, Victoria Colvin’s list of victories in equestrian sport is already longer than many seasoned veterans, having earned championships and awards in prestigious competitions across the country since she was a child. Though Colvin’s reign has extended to multiple states, she rode to many competitive highlights in her hometown of Wellington, adding more sweetness to her success. 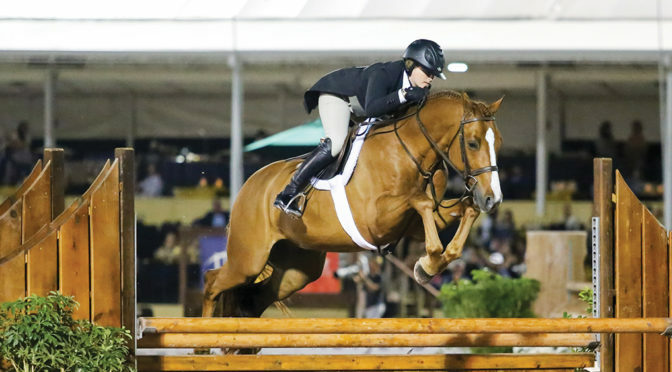 Boasting titles in the hunter, jumper and equitation rings, the young professional is a frequent sight in the winner’s circle at South Florida’s top horse shows, and she has already added more trophies to her growing collection since the beginning of the 2019 season. Thanks to her natural talent and consistent eye, Colvin set herself up for industry success following a highly productive junior career as one of the winningest young riders in history. She claimed titles in the 2012 and 2014 annual George Morris Excellence in Equitation Championships, both held at the Palm Beach International Equestrian Center, which instigated her subsequent command of equitation classes, during which time she topped the podium in almost all of the country’s major finals. Since aging out of the equitation divisions, she has rallied in the hunter and jumper rings, now also training her own students to follow in her footsteps. Colvin has solidified herself as a formidable force, and some of her best showings have been on home turf. 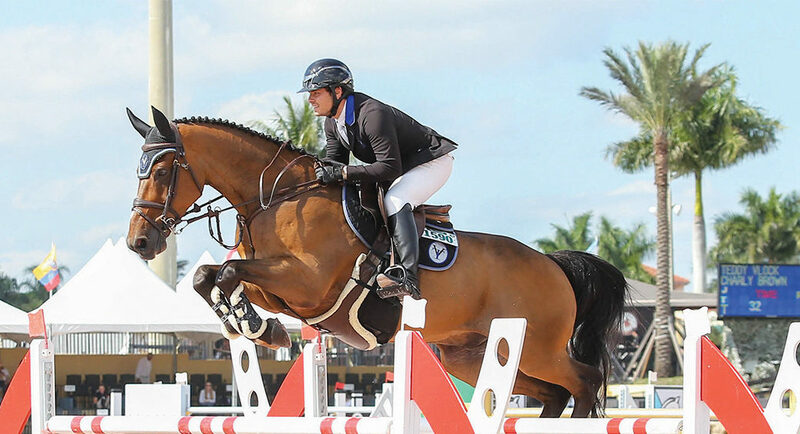 In 2019 alone, Colvin triumphed aboard Brad Wolf’s Private Practice in the hotly contested $100,000 WCHR Peter Wetherill Palm Beach Hunter Spectacular at WEF, her fifth time winning the flagship event, and subsequently rode Meralex Farm’s El Primero to the top prize in the $50,000 USHJA International Hunter Derby during the Palm Beach Masters Series’ Deeridge Derby, where she defended her title as the reigning champion. During the 2018 WEF, Colvin was awarded the status of WEF Overall Hunter Rider after navigating 18 horses to champion or reserve champion honors 29 times in a variety of hunter divisions. In the jumper ring, she raced to the top in the $25,000 Hermes U25 Grand Prix Team Event as the only double clear in the irons aboard John and Stephanie Ingram’s I Love Lucy, and later won the $25,000 CP National Grand Prix with Neil Jones Equestrian’s Clochard, despite having only recently sat on the horse for the first time. Colvin aptly made her debut appearance in Grand Prix competition in Wellington. At the young age of 13, she navigated Rivers Edge’s Monsieur Du Reverdy to the lead spot in the victory gallop in the $25,000 ESP Spring 6 Grand Prix ahead of 30 other seasoned competitors as a rookie to the class. Since then, the 21-year-old has been a contender in many more upper-level classes in Wellington, sometimes besting counterparts more than double her years from countries across the globe. As a thriving competitor and trainer, Colvin has made a name for herself on the international stage, all from her hometown. 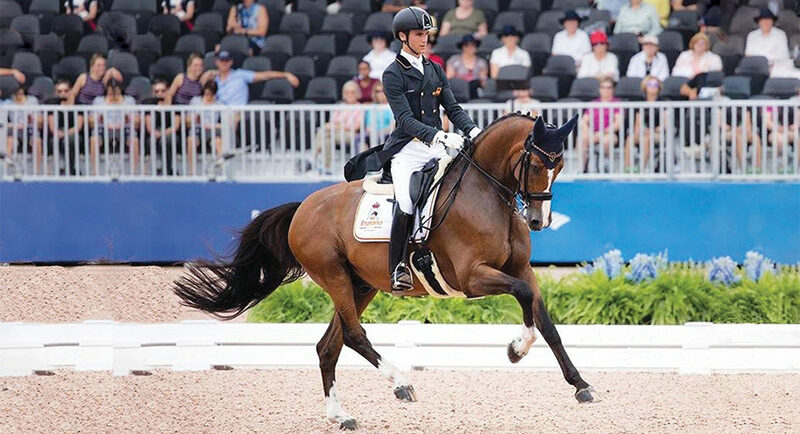 With so many local and national opportunities for greatness at her disposal and a long list of victories bolstering her career, she has certainly taken advantage of all that Wellington’s equestrian scene has to offer. The inaugural Chesapeake International Draft Horse Show was held Feb. 8-10 at Wellington’s Crab Orchard Equestrian Estate, donated for the weekend by Frank and Monica McCourt. Founded by Victoria McCullough, the event was a marriage of her passion for draft horse breeds and her love of Wellington. A change from the sport horses that usually frequent Wellington, the world-class Clydesdales, Percherons and Belgians flocked to the show to exhibit their power, agility and beauty. The show was a weekend of fun and excitement with families traveling to Wellington from all over the United States and Canada. A true family affair, most participants showcase generations of family and teamwork, whether they groom the horses, drive in competition or are responsible for standing at their heads while they are evaluated by the judge. The joys of being in the South Florida sun were echoed all weekend by exhibitors and was a welcomed change from the sport’s usual northern venues. The three-day weekend saw tough competition and stand-out performances as teams vied for valuable points to qualify for the finals in the fall. Draft horse competition may be new to Wellington, but it has a loyal following across North America. The weekend was held as part of the North American Six-Horse Hitch Classic Series, comprised of more than 60 qualifying competitions. Started in 1987 as a way to bring awareness to the draft breeds, the series is now a well-recognized event, with locals coming back each year to cheer on their favorite teams when they come to town. Although it had humble beginnings, the series has grown to offer generous prize money and travel funds for those accepted to the final. 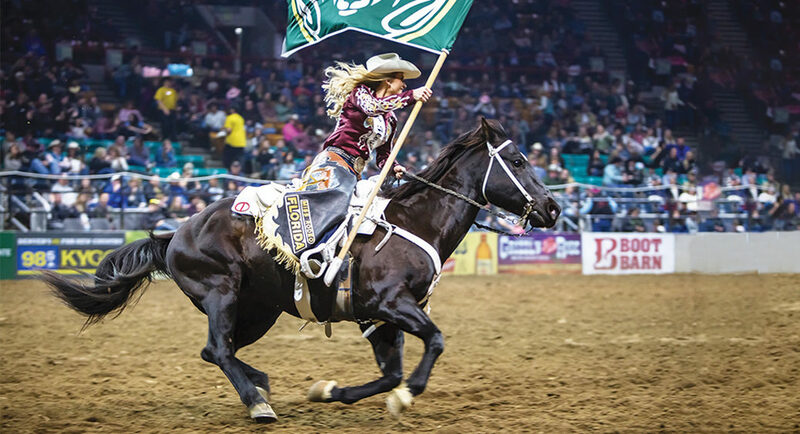 Now considered the “triple crown” of draft horse competition, the sport is well followed within the equestrian community and is a welcomed addition to Wellington, which boasts the best in equestrian competition during the winter show season. As a highly respected philanthropist and horsewoman, McCullough also focused the weekend on giving back to two charities that are close to her heart — the Young Singers of the Palm Beaches and the Equus Foundation. The Young Singers of the Palm Beaches is an award-winning community children’s choir based at the Kravis Center for the Performing Arts. The group put on an exciting show during Saturday’s intermission and gave exhibitors a taste of the set list for their upcoming performance at the Kravis Center in May featuring familiar Broadway tunes. The Equus Foundation is the only national charity fully dedicated to ensuring the welfare of America’s horses and fostering the bond between humans and equines. By focusing its efforts on empowering equine charities, inspiring horse lovers and educating the public, the foundation’s mission is to protect America’s equines and strengthen the connection between horses and people. Equus Foundation representatives were in the spotlight during Sunday’s intermission, including Angeli along with EquuStars Jessica Springsteen and Clementine Goutal. The three brought rescued mini pony Teddy, now owned by Georgina Bloomberg, as a shining example of how a horse or pony in need can find a second chance. The Chesapeake International Draft Horse Show invited exhibitors to learn about a sport that was new to many of them. With classes ranging from the Classic Eight-Horse Hitch to the Unicorn Hitch, the teamwork and versatility of gentle giants were on display as they pulled both four-wheel wagons and two-wheel carts in teams of two, four, six and eight. Talented female drivers were showcased with two classes dedicated to women drivers and their hitches. The Express Ranches team of Percherons had a successful weekend, winning the Ladies Cart class as well as the Classic Six-Horse Hitch and Eight-Horse Hitch classes. 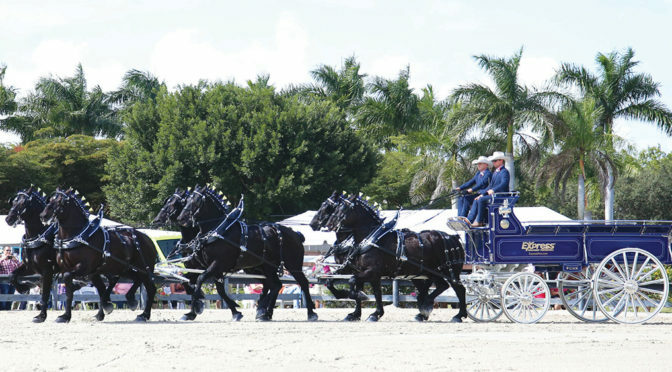 Zubrod Percherons were another strong force, earning the blue in the Percheron Six-Horse Hitch, the Four-Horse Hitch and the Unicorn Hitch classes. The dedication of each team was on display through the beautifully adorned manes and tails of their horses, hitched with polished tack to each team’s unique wagon. Braided into their manes and tails were special draft horse accessories that featured mane rolls matched to the team colors, along with shiny flights that made each horse look uniform to the next. The feeling of family and community was apparent, bringing the crowd together to celebrate the passion and love for these gentle giants. The Chesapeake International Draft Horse Show would not have been possible without the generous support of Express Ranches, Hunting Creek Farm, Anderson Farms, Burger Barn, and Frank and Monica McCourt, who donated their stunning equestrian estate, which is currently offered for sale. McCullough looks forward to welcoming the draft teams back next year to Wellington and making the event a prominent stop on the calendar. Visit www.naclassicseries.com to learn more about the North American Six-Horse Hitch Classic Series. For Wellington residents Gil and Jennifer Martinez, supporting the nonprofit organization Clinics Can Help (CCH) and its upcoming sixth annual Golf Classic on April 26 at the Wellington National Golf Club has become a family affair. The tournament will benefit CCH’s Kinder Project, which provides free medical equipment and supplies to families with children who have special needs and serious medical conditions. Little did Gil and Jennifer know when they first got involved with the local nonprofit that it would someday help two members of their own family and engage the entire Martinez clan, including Gil’s father, retired Major League Baseball player Dennis Martinez. Jennifer first met Owen O’Neill, the founder and CEO of Clinics Can Help, when both worked at Hospice of Palm Beach County in the early 2000s. Jennifer worked in communications, and Owen served as a registered nurse. It was while Owen was providing end-of-life care that the spark of an idea for Clinics Can Help first ignited. He became keenly aware of the painful reminder home medical equipment represented to families after a loved one had passed. To alleviate his clients’ distress and help them unload the equipment that no one else would take, Owen began hauling hospital beds, wheelchairs and nebulizers in his pickup truck and storing them in his garage. He quickly discovered that the items were a godsend to local clinics for the underserved. Their clients needed medical equipment for at-home care but were uninsured and could not afford to buy them on their own. Soon, word got out about the hospice nurse offering free equipment, and demand skyrocketed. Owen realized he had uncovered a significant unmet need in Palm Beach County. By 2005, he saw the opportunity to help thousands of people by turning his idea into a charity called Clinics Can Help. Thanks to funding from local foundations and donors, Clinics Can Help has grown and expanded to a 5,000-square-foot facility in West Palm Beach and six staff members. In the last 10 years, the agency has helped 10,120 clients and donated more than $5 million worth of medical equipment and supplies. In Wellington alone, 343 children and adults have received medical equipment and supplies during the last five years. Clinics Can Help is the only organization of its kind in Florida and one of the largest in the U.S. providing free durable medical equipment to help people with mobility challenges. Jennifer, now the president of her own PR firm, JLM Communications, has supported Owen every step of the way by helping him share CCH’s story with the community. She never thought she and Gil would someday turn to the charity to help their own family. In 2011, their nephew Sebastian suffered a devastating spinal stroke at the age of two that left him partially paralyzed from the waist down. Gil’s brother Dennis and his wife Maritza did everything they could for their little boy. A long-awaited visit to Shriners Hospital for Children finally became a reality, but a wheelchair would help Sebastian’s trip tremendously. That’s when CCH sprung to action. They provided a wheelchair that was perfect for Sebastian’s needs, tailored for his size and capabilities. To Gil and his family, the wheelchair represented so much more than a piece of equipment — it meant hope, dignity and more independence for Sebastian. The impact that CCH had on Sebastian drew Gil into becoming an active volunteer as a member of the golf tournament committee. His other family members have all supported the event, helping it raise more than $100,000 over the last five years. But it was Gil’s father who added to the celebrity element that golf great Dana Quigley had created. 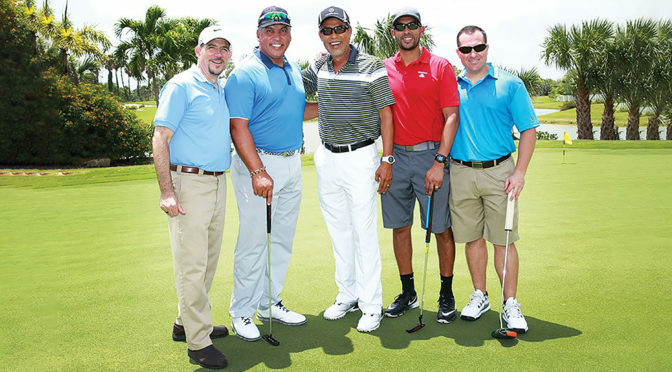 By attending and bringing along other pros, including fellow Venezuelan player Andrés Galarraga, they were helping to generate added awareness and funds to support the grassroots organization. Gil is excited to bring the tournament to his hometown of Wellington for the first time. He sees the course as a major driver for attendance and funding because of its exclusivity, course design by the legendary Johnny Miller, and its ranking as one of the nation’s Top 75 Private Golf Courses by Golf Digest. Also sure to draw attention and players is CBS 12 morning anchor Matt Lincoln, who is serving as this year’s event chair, and longtime CCH supporter Quigley, who is serving as honorary chair. The tournament features a 1 p.m. shotgun start, prizes for closest to the pin, longest drive, a putting contest and hole in one. Following the game, players and attendees are invited to enjoy delicious food, a silent auction and an awards ceremony. More than 6,200 children in Palm Beach County live with special needs, and that doesn’t include those who are stricken with a serious illness or are involved in accidents. With his prior training as a nurse, Owen understands just how important the right medical equipment is to help a child improve mobility. The Clinics Can Help sixth annual Golf Classic will be held at the Wellington National Golf Club (400 Binks Forest Drive, Wellington) on Friday, April 26 with a 1 p.m. shotgun start. For more information, call (561) 640-2995 or visit www.clinicscanhelp.org. 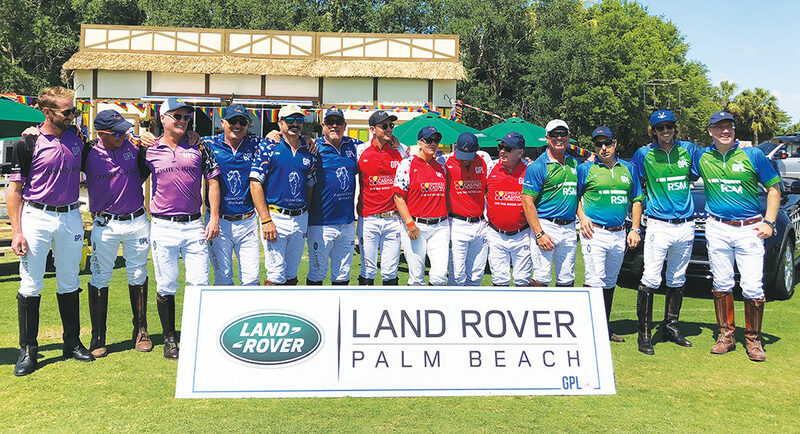 Polo players and fans convened at the renowned International Polo Club Palm Beach on Feb. 16 for the annual Lucchese 40-Goal Polo Challenge. 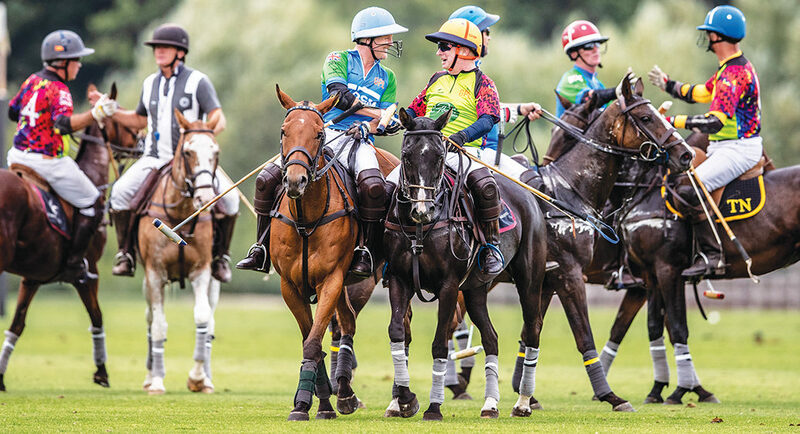 The match is the marquee fundraising event for the Polo Players Support Group, a nonprofit that provides financial support for seriously injured and ill polo players and grooms. The event raised $375,000, which will be used to help members of the polo family in need. The event featured two star-studded lineups. The opening act, the Future 10s match, was a four-chukker display of the future. Junior polo players with familiar surnames, such as Hope Arellano, Miki Novillo Astrada and Antonio Aguerre, were joined by young Americans, such as Jack Whitman and Aiden Meeker. The youngsters impressed the crowd with masterful moves usually seen at the top level of the sport. U.S. Polo Assn. (Antonio Aguerre, Finn Secunda, Jack Whitman and Hope Arellano) slid past Port Mayaca Polo Club (Florencio Lanusse, Miki Novillo Astrada, Aiden Meeker and Milly Hine) to end the match 4-3. The high-goalers had a tough act to follow, but they were able to deliver. Four 10-goalers and four past 10-goalers made up the Airstream (Nacho Novillo Astrada, Polito Pieres, Sapo Caset and Miguel Novillo Astrada) and Pilot Catastrophe Services (Agustin Merlos, Mariano Aguerre, Hilario Ulloa and Facundo Pieres) teams. The game started with what would turn out to be the Tito’s Handmade Vodka Longshot of the Day award, made by Polito Pieres in the first 30 seconds of the game. Play throughout the first half remained open and fast, giving spectators the unique opportunity to view an impressive high level of polo. At the halfway point, Airstream held the lead by one, thanks to two vital goals by Miguel Novillo Astrada. 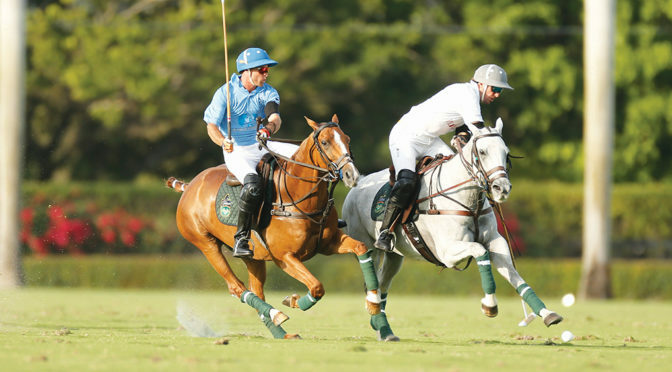 The third chukker began with Airstream’s Caset catapulting his team ahead by scoring two consecutive goals. Pilot’s Ulloa responded with his first goal of the game in an attempt to put his team in the lead for the first time. The rest of the third chukker, and into the fourth, Airstream held onto the lead, despite goal attempts from Pilot’s Aguerre and Facundo Pieres. The final score of the game settled with Airstream winning 8-6. Best Playing Pony, sponsored by 5-Star Builders, was awarded to Pucho, played by Caset. Players received Rich Roenisch bronzes, sponsored by Port Mayaca Polo Club, Gillian Johnston and the Orthwein family, in memory of Steve Orthwein Sr., a great supporter of the organization who passed away in 2018. Despite Airstream’s repeat victory, players from both teams were happy to donate their time to this vital fundraising event. “Playing in the 40-Goal Challenge is a great opportunity to help others, and I think that anybody in our situation would do the same thing to help out,” said former 10-goaler Mariano Aguerre, who has played in the 40-Goal Challenge nine times. Miguel Novillo Astrada, who has been playing in the event since 2004, noted on the importance of participating. “I’ve been playing for many years, and I think it’s a very good cause. It’s a way of helping a great organization that gives a lot to polo. It’s great to be here,” he said. Following the game and awards presentation on the field, attendees made their way to the Pavilion at IPC, where they enjoyed a cocktail hour while bidding on silent auction items before piling into a sold-out steak and lobster full-course dinner, sponsored by the Whitman Family. High-priced items such as a complete set of Paul Brown prints sold for $5,300 to Chris Desino; the Costa Rica vacation, donated by the Escobar family, sold for $14,000 to Steve and Jessica Carbone; and newly inducted Museum of Polo and Hall of Fame Iglehart Award winner Karlene Beal Garber purchased the unique vacation to Costa Careyes for $5,000. In addition, all participating player jerseys were auctioned off throughout the evening. Continuing the momentum of the games on display throughout the day, the highest jersey bid was not from a 10-goaler’s jersey but from junior player, Hope Arellano, whose father, 8-goaler Julio Arellano, received financial assistance after a traumatic polo-related accident in 2018. Her jersey was won by superstar show jumper Ashlee Bond, winner of the $72,000 NetJets Classic at the Palm Beach Masters that day at nearby Deeridge Farms. The Polo Players Support Group thanks the sponsors, players, donors, ticket and table purchasers, volunteers and more. Thanks to the annual 40-Goal Polo Challenge and its supporters, the organization has awarded more than $2.5 million to 80 seriously injured and ill polo players and grooms. Learn more about the Polo Players Support Group at www.polosupport.com. For a decade, DeVine Bistro has become more like a family gathering place for many diners who frequent this Wellington gem. Big on feeding people’s appetites for fine food, quaint seating and a welcoming atmosphere, it’s tucked away in a quiet plaza in front of the Mall at Wellington Green. “When I opened this restaurant, I wanted it to be more ‘comfort food’ — and comfortable,” said Executive Chef Dave Palmateer, owner of DeVine Bistro. Palmateer describes his cuisine as American Continental, with a familiar feel. While the food may be familiar, the presentation and ingredients are top notch. A labor of love is put into each dish. Palmateer attributes the bistro’s longevity to his family, including his two teenage sons, along with the restaurant’s longtime staff. Sara Palmateer holds multiple roles at DeVine Bistro, including pastry chef. Those popular pastries include her banana cream pie with a chocolate layered graham cracker crust and fresh banana chunks. Among Palmateer’s creations are the popular pistachio-crusted salmon with sweet potatoes, as well as Guinness-braised short ribs. Palmateer’s love of food, along with his work ethic, grew from his parents’ restaurant in upstate New York. The family of eight siblings spent half their time in New York, and half in Florida. His parents eventually opened a restaurant in North Palm Beach. 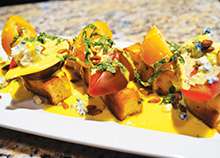 One of DeVine’s most beloved appetizers is the heirloom tomato bruschetta with Danish blue cheese. “I make a homemade focaccia bread, and I toast it with a little olive oil, adding wedges of heirloom tomatoes on it with pine nuts and Danish blue cheese with a lemon champagne over that with fresh basil. It looks beautiful,” Palmateer said. There are many great options at the bar, too. Happy hour runs daily from 5 to 7 p.m. when everything is two-for-one. Sunday through Thursday, with an entrée, a guest can get a “bottomless” glass of house wine for just $6. Many community regulars and local celebrities, as well as a number of equestrians, frequent DeVine Bistro. The main dining room is filled with warm colors of golds and browns, along with inviting booths. A long black granite bar, with the kitchen in view, greets guests at the door. The bistro seats 150, including an outdoor patio. The restaurant serves as many as 300 to 400 people a night and is open for dinner Tuesday through Sunday starting at 5 p.m.
Palmateer gives much credit to his experience at Café Chardonnay in Palm Beach Gardens. He later opened Off the Vine Bistro near PGA Blvd. Now, working closely with his family has created a stronger bond, as well as taught a strong work ethic. His two sons not only work hard in the restaurant, but outside as well. Michael, 18, is an All-District, All-State football player at Wellington High School, while Zachary, 16, is All-District in the WHS band. And both, their father added, are dedicated brothers to their sister. Each summer, the Palmateers close their bistro doors for two weeks so they can spend time in New York’s Catskill Mountains, where their family, love of food and tradition began. DeVine Bistro is located at 2465 S. State Road 7, Suite 300, in front of the Mall at Wellington Green. For reservations, call (561) 204-5432. Visit www.devinebistro.com for more info. For Anna Niehaus of Keller Williams Luxury International, her connection to Wellington began across the Atlantic Ocean. That connection led to an invitation to spend some time in Massachusetts and Florida. It was the latter location that changed her life. “I fell in love with the warm weather and the small town of Wellington with all its equestrian activities and never left,” Niehaus said. This has worked out well, given her long equestrian background and international heritage. Niehaus sees Wellington as a real estate dream come true. “With such a wide range of properties to choose from, there is something for everybody: a small condo in town, a single-family home in a gated community, a small farm in Loxahatchee or a large equestrian estate close to the showgrounds,” she explained. Niehaus counts herself among the countless residents who have fallen under Wellington’s sway. 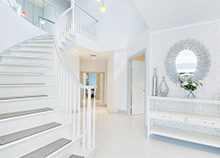 To contact Anna Niehaus of Keller Williams Luxury International, call (561) 214-3310, e-mail annaniehaus@comcast.net or visit www.annaniehaus.com. Over the past several years, the United States Polo Association has built a talented communications department that is dedicated to marketing the sport of polo and highlighting USPA tournaments for members and fans. With his successful track record promoting the Flagler Museum in the Town of Palm Beach, Matthew Baran was brought on board, rising to the director of communications. Baran, a native Floridian born and raised in Jupiter, works out of the USPA offices on Lake Worth Road next to the Museum of Polo and Hall of Fame, spearheading an ambitious program promoting polo across the nation. This includes a wide array of streaming video content. When not working, Baran enjoys surfing or swimming at the beach, playing tennis, visiting local art shows, and hanging out with his family and friends. It is an impressive sport, and he is certainly a polo fan. To bring in more players to the sport, the USPA launched a “Learn to Play” campaign, which provides a platform for all member clubs to have a strong presence at uspolo.org. The Gauntlet of Polo is comprised of America’s most historic and prestigious tournaments: the C.V. Whitney Cup, the USPA Gold Cup and the U.S. Open Polo Championship. “There is $1 million on the line, and the tournament series features 16 teams and more than 800 horses competing for a chance to be crowned Gauntlet Champion,” Baran said. All the work that Baran is doing is directly in line with the longstanding mission of the USPA. “The USPA was organized and exists for the purposes of promoting the game of polo; coordinating the activities of its member clubs and registered players; arranging and supervising polo tournaments, competitions and games; and providing rules, handicaps and conditions for those tournaments, competitions and games, including the safety and welfare of participants and mounts,” Baran explained. Founded in 1890, the USPA is the national governing body for the sport of polo. With thousands of individual members, the USPA oversees 40 national tournaments. For more information, visit www.uspolo.org or call (800) 232-8772. Dr. Hart Collier, who recently joined the Wellness Experience in Wellington, brings nearly 25 years of familiarity with the western communities. He grew up in the Acreage/Loxahatchee area, attending Seminole Ridge High School, before relocating to Tampa to earn his undergraduate degree and chiropractic degree. Moving back last year to again be closer to his family, Collier joined the team at the Wellness Experience at the beginning of the year. Laurich founded the Wellness Experience in Wellington as a secondary location for his successful practice in Boca Raton. Later, he sold his initial facility to devote all his energies to treating Wellington-area patients from the facility in the Kobosko’s Crossing plaza. Collier said that the Wellness Experience, with its objectives of improving function, reducing pain and increasing a patient’s overall quality of life, is different from many other chiropractic practices. The Wellness Experience was founded to create a facility that maintains the original chiropractic principles with the addition of technology to improve each patient’s quality of life. The doctors at the facility are trained to locate, analyze and correct where there is nerve interference along the spinal column. Using gentle force, they change the structure of the spine to allow the brain to communicate better with the rest of the body, thus assisting the body in healing itself. 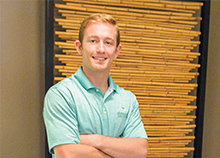 Collier’s interest in chiropractic procedures began when he was very young. Collier, who is currently single, is close to his family. “I have two amazing parents, an identical twin, older brother, younger sister and the cutest little niece, Grace,” he said. Participating in a range of activities, Collier enjoys the outdoors. “My hobbies are fitness and exercises, fishing and diving, and any sport, really,” he said. After treating some riders participating in the Great Charity Challenge, Collier has developed an interest in equestrian sports. “Even though I grew up in the area, I’ve only been to one jumping event and no polo games, but I plan on fixing that soon,” he said. Collier invites residents to learn more about chiropractic health and the Wellness Experience. “No matter what issue a person is dealing with, the Wellness Experience has the knowledge and traditional skills combined with the latest techniques and high-tech equipment to relieve pain and improve performance and quality of life,” he said. The practice maintains a web site offering a great deal of information about the services available. The Wellness Experience is located at 9180 Forest Hill Blvd. in Wellington. For more information, call (561) 333-5351. Bruce Wagner, director of the Public Works Department for the Village of Wellington, believes that “without your team, you’re nothing.” This phrase is a mantra for everything, from his love of sports to his management style. His journey to Wellington was unusual for administrators working in the government sector. Wagner, a native of New York’s Long Island, spent most of his career working in construction and various forms of landscaping. In 1996, Wagner and his wife moved to Florida for the first time. They chose Orlando, where he landed a position that ended up being a dream job — working for Walt Disney World. A few years later, however, the Wagners moved back to New York to be closer to family and had their first child. Shortly after his daughter turned one, they moved back to Florida and brought the family with them this time. Living in Coconut Creek, Wagner started the next chapter of his career with humble beginnings. But 2004 was a difficult hurricane season. It meant Wagner was spending more and more time managing properties and away from home. His wife began researching positions further north and found an opening with the Village of Wellington. After nearly 14 years with the Village of Wellington, Wagner has found a second version of the happiest place on earth. At approximately 46 square miles, Wellington is about the same size as Walt Disney World. Some days it’s like Tomorrow Land, some days it’s like Fantasy Land and some days it’s like Adventure Land. It’s never dull. “There is something new every day in public works, and we love it,” Wagner said. 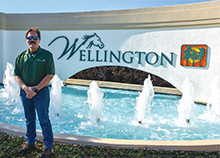 The Public Works Department is crucial to the mission of Wellington. Some of his proudest accomplishments for the department include twice earning American Public Works Association (APWA) accreditation, and the role played in the Parks & Recreation Department’s certification by the Commission for Accreditation of Parks and Recreation Agencies (CAPRA). “We are one of maybe nine entities in the whole state to get both of those awards,” Wagner noted. Aside from pride over his work and team, Wagner also has a strong sense of family. Married for 29 years, Wagner and his wife are raising two children with a sense of love for sharing adventures. Sports also plays a big part in Wagner’s everyday life and philosophy. Wagner’s team mentality, combined with his respect for both administration and the crew he supervises, makes for an environment set up for sustainable success. From succession plans to cross training and preparation for the future in Wellington, the foundation keeps coming back to one thing — “without your team, you’re nothing.” Wagner sees a bright future filled with opportunity for his team at Wellington’s Public Works Department. Palm Beach Polo homes, like this one located in the Muirfield neighborhood, offer the quintessential Wellington lifestyle. Behind the manned security gates lie peaceful walking, jogging and biking trails, tennis courts, a challenging golf course, an exercise/workout room and a roomy clubhouse. Inside the home, the designer’s influence is unmistakable. A bright, contemporary aesthetic rules the 3,000-square-foot living space. With its open floor plan, three bedrooms, three-and-a-half baths, recently upgraded kitchen, two patios and two-car garage, home life was never more convenient. Main Living Area: This long view of the downstairs living shows a seating area and the formal dining room with the home’s pool beckoning from all sides. Entryway: A sweeping grand staircase and statement wall at the front entrance provide a hint of the home that lies beyond. A peek of the catwalk and upstairs window suggest there’s more — much more — and there is. Seating Area: Play the piano, watch TV, take a dip or just sit quietly reading a magazine in the seating area. White marble and tile extend throughout the ground floor of the home, giving a dramatic and cohesive look to the space. Kitchen: Who doesn’t love a sparkling white kitchen? This newly renovated space features state-of-the-art Bosch appliances, a breakfast bar with in-counter sink and dishwasher, two heavenly skylights and a large pantry. Foyer Area: Contemporary hanging lights offer their welcome to guests entering the home’s spacious foyer area. Island: An island placed perpendicular to the kitchen is the perfect morning launching-off spot for backpacks, briefcases and that all-important cup of coffee. It also serves as a central gathering place. Master Suite: A master suite located on the main floor defines the split bedroom plan. The room boasts a walk-in closet, a bumped-out seating area and a master bath with dual sinks. Master Bath: The master bath features a spacious glass-walled walk-in shower, as well as a stand-alone clawfoot tub. Guest Bedroom: A carpeted bedroom with an en suite bathroom offers plenty of room for guests. The arched window overlooks the front garden and green space. Aerial View: A bird’s eye view of the property (left) shows off the home’s cedar shake roof, one of the hallmarks of the Palm Beach Polo community, as well as the nearby golf course. Pool Deck: Long-ranging views from this premium lakefront lot (right) show the home’s completely fenced backyard, as well as the spacious pool deck.